Sugar is a big controversy. Everyone knows that eating candy, cakes, ice cream, loads of white bread and pure sugar and drinking sodas is not good for you. Most of us try to moderate our intake and many times we struggle with it. There’s always that donut with delicious icing that someone at work treated you, the ice cream with your friends, the tasty dessert cake after the nice restaurant dinner. And then there’s the sugar in the syrup they put in your morning coffee at the coffee shop, the hidden sugars in processed food that you have for TV dinner, the sugary breakfast flakes. If you start looking at the labels of the food you buy you are gonna be chocked. All the carbohydrates that aren’t fibers, are becoming sugar in your body. If there is 40 grams of carbohydrates, they become 40 grams of glucose after being digested. No matter how slow they are. It has nothing to do with education, IQ levels, knowledge or even common sense. It’s all in the habits and habituated feelings and thoughts around food. We feel like we deserve that extra piece of candy, cookie, cake or ice cream. Or we’ll tell our selves that the exercise we did/are going to to do gives us room for it. It’s deceptive, that white powder. Maybe you won’t notice what it does to you. If your body is healthy enough and your systems are adaptable, you will have enough insulin to store away the sugar load and keep your glucose levels in check. The more sugar (of any kind) you eat, the more insulin is needed. The more insulin you have in your blood, the less sensitive your insulin receptors become, that’s the natural see-saw reaction in your body. When the receptors become less sensitive, you need to produce more insulin to lower your blo od sugar, and so on. As long as your pancreas is healthy, this process is going to work fine, even though you will have blood sugar spikes and lows all day long. You might notice them, or you might not, since we all differ in sensitivity. 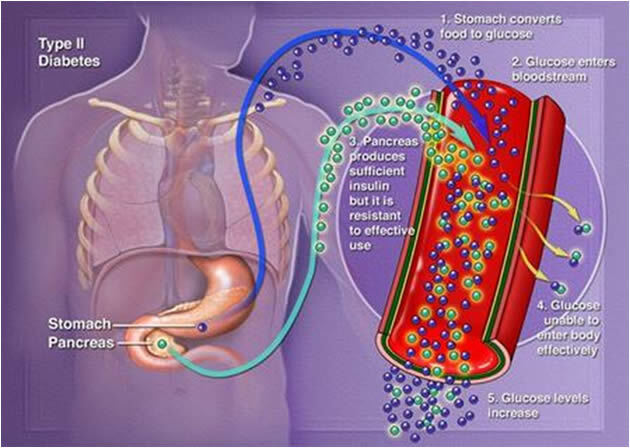 The day your pancreas can’t produce enough insulin to keep the blood sugar in check your on your way towards diabetes. “Well, why does that matter?” you might say. There’s medications and I’m certainly not there yet…. The big problem with diabetes is the high blood sugar levels, because the sugars tend to react with proteins and fats in the body, a process called glycosylation. When this happens it renders the molecule useless, because it’s chemical properties changes. As for proteins, which many times are receptors, enzymes and identification tags for different molecules, it can change how hormones, cholesterol and signal molecules are taken up and the effects they have. So you might change how sensitive you get to a hormone, and hence the body sees that as needing to produce more of it since the desired effects didn’t happen with the normal amount. This can lead to a downward spiral, exhausting the gland producing the hormone as an end result. In the case of cholesterol the protein on the bearer molecule (LDL/HDL), can suffer changes and not be recognizable when arriving to the cells and thus not be taken up, which leads to higher cholesterol levels in the blood but cholesterol deficiency in the cells. If you are unlucky enough to take a blood test assessing your lipids at that point, you might end up on statins, lipid lowering drugs, just because they are on the wrong place. The body recognizes the faulty proteins and the immune system cleans them up, so new ones can be made. Having a lot of glycosylated proteins means a higher demand for cleaning and pumps up the inflammatory process needed for cleaning, keeping you in a overall higher state of stress. It’s a good idea to keep the inflammation in your body as low as possible, since it triggers a lot of reactions that can be damaging for the cells. You can also experience joint and soft tissue problems because of the glycosylation of proteins. The changes in the proteins in your connective tissu e render it less flexible and the subsequent inflammation can produce fibrous scars that are difficult to heal. The faulty proteins also work less efficiently in your cartilage and can result in arthritic changes. One not uncommon problem among diabetics is trigger finger (it can happen to people without blood sugar issues as well, but the risk are much higher with poor blood sugar control). 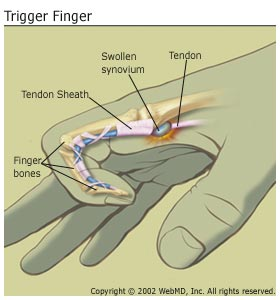 This is a disease where the flexor tendon to a finger, usually the third or fourth gets inflamed and swollen, so it can’t pass through the structures holding it and the finger gets stuck in a flexed position. No fun at all. For me this means getting of the sugar, all of it. No candy, cakes, cookies, ice cream, breakfast cereal, bread, pasta, rice, sodas etc. Of course there’ll still be some cabohydrates in my diet, through bell peppers, tomatoes, leafy green and cruciferous vegetables, with the meat I eat and the little fruits I consume. But compared to a normal diet (whatever that is nowadays) my sugar load is minimal. We are all different and some people tolerate higher levels of carbohydrates than others and it is dynamic. It changes with age, hormones, stress etc. But I’m sure that keeping away from sugar is beneficial for you. Start with getting of the white sugar. Have a sugar free month where you don’t eat cookies, candy, ice cream, cakes and go low on the fruit (especially bananas), choose low sugar alternatives to pasta and potatoes (you can find some tips here) and make sure to cook your own food so you know your sugar load. I was surprised by all the tastes that were coming back to me, after the sugar was gone. Heavy whipping cream is sweet! Sugar is an addictive substance, it’s actually in the same realm as heroine, giving the same pleasure response in the brain, so expect some heavy resistance to start with. There might be withdrawal symptoms, cold sweats, nausea, bad sleep, tremor. No fun. That doesn’t mean it’s bad for you to stay away from it, does it? What would you tell a smoker that’s weaning off cigarettes? “Are you feeling bad? You better start smoking again then.” Probably not. It’s all about getting to a point where you can choose what to eat, and enjoy the occasional sweet things you eat. Remember, I’m not talking about loosing weight, even though that might be a “side effect” of keeping away from the sugar. I’m talking about staying healthy and feeling well – hopefully throughout your life. And don’t forget to add in the good fats as you take away the sugar/carbohydrates, you still need the energy. One gram of fat has double the energy of one gram of carbohydrates. Here‘s a little go to list of how you can get started. Buy whole foods. By cooking fresh produce, you know what you are putting into your body. Make sure you find good quality produce. Go local as far as possible and try to choose vegetables that are organic and free from pesticides. When it comes to meat try to find grass fed, locally raised and butchered. Maybe there is a good butcher in your town, that can tell you about the farm where the animals have been raised. You don’t have to go crazy about it, take one step at a time and maybe just starting out cooking your own food is a big step. That’s ok.
You can make it simple. There are an abundance of tips and recipes out there on the web. 2. Lower your intake of sugar and carbohydrates. Sugar of any kind, white or brown, syrups, honey etc. If you really want to sweeten something, use Stevia of some kind. Grains, especially processed wheat. Stay away from pasta, bread, tortillas etc. Most preferably, eliminate them from your diet. Starchy foods. That includes most of the things that grow under ground – potatoes, beets and other tubers. Leafy greens like spinach, arugula and kale. Sugar and carbohydrates are what raises insulin, and high levels of insulin will not only make you gain weight but also be more prone to inflammatory diseases, including heart disease, and type 2 diabetes. Gluten has been associated with autoimmune disorders like Hashimoto’s thyroditis and Celiac Disease. Butter – preferably organic from grass fed cows. Coconut oil – organic, cold pressed. Contains awesome MCT – brain food! Olive oil – organic, cold pressed. Contains oleic acid, that has some nice anti-inflammatory properties. Get fatty meats, like beef with the fat still around it’s edges. Chicken or Turkey with it’s skin and Salmon are other good sources. You body consist of approximately 60 -65% water and the cells need the right amount of water to function properly. The right amount of water keeps the electrochemical gradients between the outside and the inside of the cell in the right ranges and also makes many of the chemical reactions possible. Go out, every day. Even if it’s only for five minutes. Anything is better than nothing. Take your shoes and socks of, go barefoot. Enjoy the feeling of grass or sand on the soles of your feet, the sun and wind on your skin. Hear the sounds of the birds and the wind in the trees. If you live deep in the city, find a park or an area with grass and a couple of trees. The soles of your feet have as many nerve endings as the palms of your hands. Awakening your feet will awaken your nerve system and bring you more awareness. Being bare foot also awakens the muscles in between the bones in your feet and makes them more agile and flexible. If you really, really don’t want to walk around bare foot, try the five fingers with thin soles. That will give you a bare foot experience without the fear of cutting your feet up or stepping in poo. If you’re not used to being bare foot it’s going to be a little bit awkward to begin with. But trust me, it will make your experience of being out doors so much better!